Alpacas are gentle animals that can be kept on small acreages with a low level of daily upkeep. We offer a wide range of services backed up by 20+ years experience owning & breeding alpacas. We can offer you excellent quality male and female alpacas for sale to suit all budgets, high or low. Our stud males represent some of the best genetics in the world. We have invested heavily in sourcing bloodlines with predictable advanced traits, bringing those males to the UK and offering the opportunity to other breeders to breed progeny which include these genetics. They deliver predictability for advancing fleece qualities whilst ensuring good bone and conformation in their offspring. These have been critical to our breeding programme which aims to produce healthy, show winning animals with super fine fleeces displaying advanced staple structure and density, in white and solid colours. We have a number of new stud males for 2015 that include CME Priam ll (fawn) Show Champion at Devon County in 2013 and 2014, CME Capella (light fawn)Champion Light Male at the British Alpaca Futurity 2015, Appledene Commander-in-Chief (fawn), CME Andante (white) Champion White Male at Devon County, Reserve Champion White Male at the British Alpaca Futurity 2015 and Alpaca Showtime 20154, CME Elegy(brown), CME Capriccio (fawn) and CME Florestan (white). In 2010 we welcomed three new stud males from the USA that we believe will continue the improvements in our young stock in terms of bone and fleece density. We narrowed our search down to two farms, Magical Farms, near Cleveland, Ohio, the largest breeder in America, and Cas-Cad-Nac in Vermont. LMFI Peruvian Dynamics (White) is a son of the great Majestic Peruvian Jeremiah who was Herdsire of the Year three years in a row at the All American Futurity. MFI Point Blank (Black) was sired by MFI Peruvian Jericho whose offspring have won over 124 championships and 428 ribbons for Magical alone. CCNF Talon (White) is a champion in his own right, sired by SuperNova, with a champion mother and his paternal brother and sister are both champions too. CME Tulaco Centurion’s bloodlines are evident in our herd and his son CME Priam 11 is carrying on the good work. Our jointly owned Dovecote Jaquinto (White) has been brilliantly successful in siring many progeny who have won show championships and championships. We consider both these males to be true Herd Sires, delivering predictability in their progeny with good conformation and advanced fleece traits. Jaquinto’s son CME Paris (White) is one of our working males and in 2010 was Show Champion at the Royal Bath & West and Devon County Shows. Not forgetting our stylish black Bozedown Kazzan (Black) who has a dense fleece with good structure. We offer an experienced and professional approach for the service of alpacas with a wide range of specialist skills and the support of our local veterinarian. Our own ultrasound equipment accurately monitors developing pregnancies with the assurance to our customers that the alpaca is indeed pregnant. Stud servicing is available to clients as drive-bys due to bio-security concerns. Mobile services are possible if strict bio-security protocols can be achieved. Please see our bio-security statement. Drive-by matings are when the owner brings the alpaca to our farm, observes the mating and then returns home with the served female. Spit off and pregnancy determination is the responsibility of the alpaca owner. 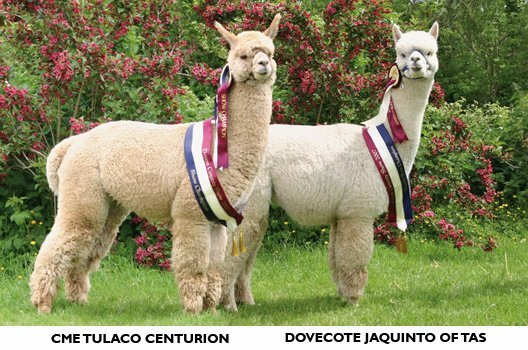 If you require any further information about the males please contact us on 01884 243579 or rachel@alpaca-uk.co.uk. We can offer you excellent quality pregnant females, gelding pet males and stud males for sale in a range of prices to suit all budgets whether large or small. If you would like to receive our regular newsletters via email please enter your details in the sign-up boxes.